Welcome to part 3 of my Umineko playthrough! We left the previous topic in the middle of chapter 3: At midnight, specifically. Commentary will resume starting post #2, so if you haven't played the game, back out now. On the third thread, tag the topic and kill. so how will they get 2 more people there? but gohda will surely have his chance to be a star soon! Ok. Ronove makes things easy and says it. "In 1967, in a hidden mansion on Rokkenjima, Beatrice-sama existed as a human." 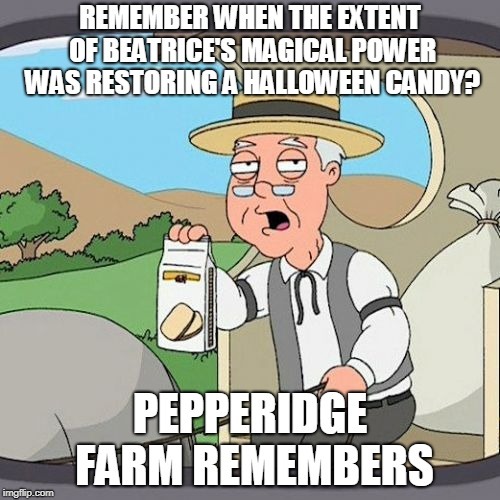 Well, that Beatrice is dead. Dead and gone. Or she's become old. i'm gonna kick myself if kumasawa is beatrice and i ranked her so low in my mastermind rankings. at the time it just didn't seem likely that the nice old lady maid would be the evil villain. but. maybe. but none of this is real, sadly. kumasawa really is just a nice old lady. and now the mansion actually has secret wartowers with hundreds of turrets? If that doesn't qualify as magic, what does? I was not aware, but at this point, I am not surprised, and was sort of thinking it would be cool if there was one. I haven't played F/S N but I'm aware it (and Tsukihime?) has fighting games and seeing these scenes, I felt Kanon and Shannon and etc could totally fit in with that. Not that any of them actually have magical powers, it's all fake, but. You can't get any bigger than this. But it's only chapter 3. Which implies certain things about what direction these "magic" scenes are going to go in, y'know? oh boy, umineko solved the problem of the unpiercable shield vs the spear that pierces anything! is teacher-beatrice actually going to win this...? no way...! but then what would happen to the story...? battler has played his fair share of layton games, i see. he knows the drill. and that's what this game is. but i'm really looking forward to seeing a chapter where the adults are alive. this'll be interesting. this time it's like... the adults (who are elitist snobs) will be like "okay whatever"
Repeat that in red if you can! why move the bodies to the parlor when 4 of them were already in kinzo's study...? actually, the servants being dead is a neat thing since it means the adults will be forced to suspect within the family. everyone will be. no easy scapegoats this time. i don't care how impossible the game gets, there's no way any of the 7 adults committed these murders. they clearly were together all night. ugh. whatever, i'm over trying to figure out how the game makes sense. i just know there's no magic. they split the bodies up into 5 different rooms...? whaat? why? Teacher-Beatrice seems to be about to confirm that my earlier theory was correct! I said, I think between chapters 2 and 3, that maybe it's possible for both the real world stuff and the magic stuff to exist - like they exist on two different planes, and what happens in one happens in the other, but justified in a different way. 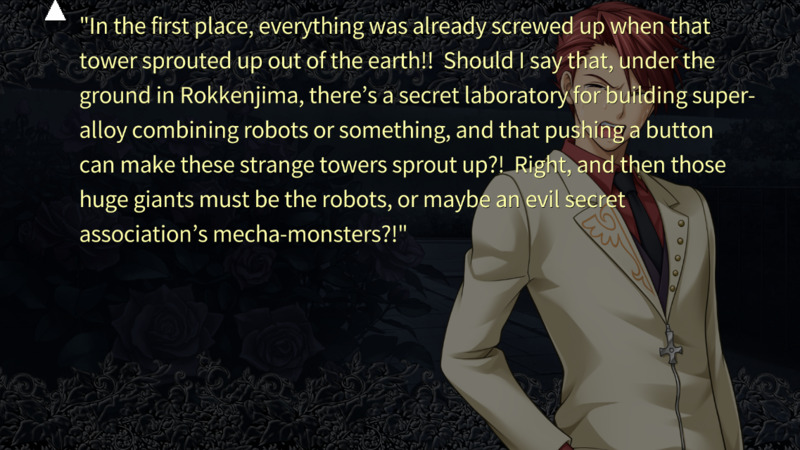 Teacher-Beatrice is starting to ask Battler about the rain dance, and Battler is like "But there's a scientific explanation for it", and now she's talking about how chemical reactions make things burn, but there used to be other theories about it. But I know where she's going. She's going to explain that magic can co-exist with science and that both can happen. Like how midichlorians make the force happen, or whatever. As a low-intelligence person, I've always sort of believed that technology is basically magic. I mean, I can't even begin to get my head around how electricity actually makes millions and millions of pixels appear on my screen and how it somehow communicates 0s and 1s to create games and movies and the internet and everything. It all seems like magic to me. I've never seen any story actually discuss these ideas though, until now. If you're low-intelligence, what does that say about the average internet user? So it's not quite like what I said? She's essentially saying that only one is correct: science or magic. Just both are possible right now. It's close enough to what I predicted, I even correctly hit on the fact that the magic we were seeing as an explanation being triggered by actual events that happened. As long as you act within the boundaries of your level, you are okay. But to be unintelligent and yet act as if you're smarter than you are - aka arrogance, or stubbornness, or ignorance, is the true problem. As well as being in denial about the things you are not smart or educated enough to know about. There's a really cool new "logic and trick" style theme that started playing after Battler got re-energized by Virgilia's advice. You guys weren't kidding about how many tracks there are. And they're all so good! for some reason, shcrodinger is written in japanese katakana as shuredinga-.